The simplest approach to assessing your students with ForAllRubrics is via the online website. Click on the My Class link in the menu bar and then select the rubric you want to work with. To start the assessment, click on the next to the student that you would like to assess. On your rubric, you score the student by simply clicking on the appropriate box in the rubric. The score will be calculated for you automatically. You can add comments for the whole rubric or for individual items. You can also record an activity name. The date of the most recent assessment for the student. 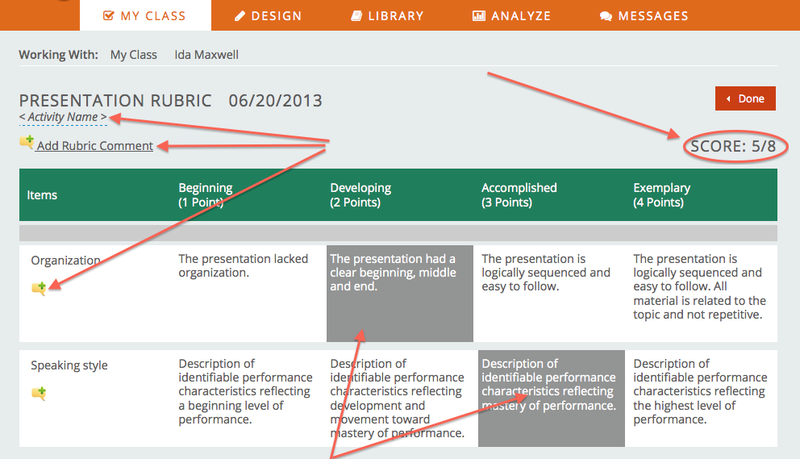 If you click on the date, it will show you the actual completed rubric. The student’s score on the rubric. Any items that weren’t scored will be considered “N/A, not applicable” and won’t be included in the total possible points. The computed percentage on the rubric. Any items that weren’t scored will be considered “N/A, not applicable” and won’t be included in the computation of the percentage. How many of the items were scored. If all the items were scored, a “check”. An icon to print the completed rubric. An icon to email the complete rubric to the emails associated with the student’s account (specified on the Admin/Manage Students page). An icon to access the student’s journal. An icon to delete the most recent completed rubric. On the My Class page, you can also Print or Email all your students’ completed rubrics in bulk or just selected students. If you want to switch which rubric you’re working with, just click on the new rubric in the My Rubrics dialog. There are a lot more capabilities in ForAllRubrics, but hopefully this quick introduction will be enough for you to get started! While you’re working on ForAllRubrics, you can learn more by accessing our FAQ (Frequently Asked Questions) or our Message Board. We also regularly post helpful information on the ForAllSystems Blog and via our twitter account @forallrubrics.